Intradiscal electrothermal therapy (IDET) is a minimally invasive procedure performed on patients who suffer from a chronic history of discogenic back pain. A study, published in 2009, by Techniques in Regional Anesthesia & Pain Management reported that discogenic pain accounts for approximately 28% to 43% of the incidence of back pain in the United States. Other studies have corroborated the fact that discogenic pain remains one of the leading causes of back pain in the U.S. The medical community is always searching for non-surgical options to help combat this widespread problem. For this reason, Intradiscal Electrothermal Therapy is an exciting conservative option to back surgery. The technique, introduced in 1997, uses a heated thermal resistive coil that is inserted through a catheter to obliterate the pain-receiving nerves of the disc. The heat generated from the coil causes thickening of the collagen fibers of the disc. This ultimately destroys the nerves that are causing pain. Prior to the procedure, the patient is positioned face-down on an x-ray table and the skin is sterilized and prepared for the injection. If sedation is needed, it will be delivered through an IV and vital signs such as blood pressure, heart rate, and breathing will be monitored. The physician injects dye that will show up on the x-ray monitor to help guide the placement of the needle. The physician then uses a thermal resistive coil, inserted through a catheter, to heat and destroy the nerve fibers. The catheter is positioned on the outer annulus fibrosus and gradually heated to approximately 194 degrees Fahrenheit. 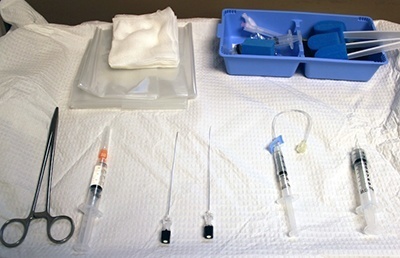 After the procedure, a band-aid is placed at the site of the injection. The entire procedure takes less than an hour. Watch Intradiscal Electrothermal Therapy, IDET- Performed Live! Considerable research has been performed regarding the benefits of Intradiscal Electrothermal Therapy for people who suffer from chronic back pain. A study reported in a 2010 edition of the Spine Journal assessed patients following Intradiscal Electrothermal Therapy procedures for discogenic pain. The results showed that over 86% of these patients felt relief of pain within one week after the procedure. Systematic reviews of the literature concerning Intradiscal Electrothermal Therapy treatments have corroborated the results found during this study. According to these reviews, the safety and efficacy of Intradiscal Electrothermal Therapy has been proven through numerous successful procedures and has been documented in several follow-up investigations. Intradiscal Electrothermal Therapy is considered a conservative treatment. However, all medical procedures carry some risk. Although rare, potential complications include infection, bleeding, nerve damage, and disc damage. Ideal candidates for Intradiscal Electrothermal Therapy will have had MRI studies or a discography that reveal degeneration or herniation of a spinal disc. 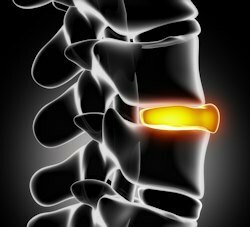 Discs in the spine absorb daily wear and tear; they also provide cushion to the vertebrae, which are separated by the discs. 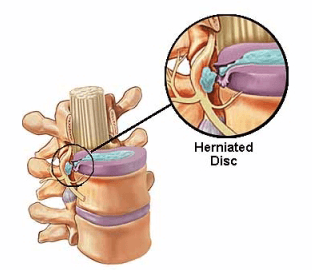 Disc herniation can also be caused by degenerative disc disease or through a traumatic injury, such as a slip or fall. When the jelly-like substance (nucleus) of the disc degenerates, it begins to harden. The disc covering, known as annulus fibrosus, also weakens and allows the disc nucleus to leak out. During this herniation, the nucleus bulges past the fibrous capsule and causes irritation in the surrounding nerve receptors. These nerves then send pain signals to the brain. Nerve damage in the cervical area can result in pain, tingling, or numbness in the arms and hands. Nerve damage in the lumbar area may result in pain, tingling, or numbness in the legs and feet. Successful Intradiscal Electrothermal Therapy procedures seal annular tears in the collagen disc covering and destroy the nerve receptors through the thickening of this outer shell. Studies have also shown that the application of heat to the disc space from Intradiscal Electrothermal Therapy may also decrease intradiscal pressure. The destruction of the nerves and the decrease in intradiscal pressure can result in less pain for the recipient of Intradiscal Electrothermal Therapy. It should also be noted that patients who smoke may have lower success rates because of the negative affect that smoking has on annular collagen tissue, and due to the fact that smoking slows down the healing process. Evidence has revealed that Intradiscal Electrothermal Therapy remains a conservative option to help pain specialists eliminate discogenic pain in the spine without the use of invasive back or neck surgery. The procedure is low in risk and the pain-relieving benefits can be experienced immediately.